The main variety of lavender cultivated in Provence is in fact not lavender at all, but a sterile hybrid plant called lavandin. Lavandin is very rare in the wild and results from the cross-pollinization of True French Lavender ( Lavandula angustifolia ) and Spike Lavender ( Lavandula latifolia ). This rarity is because both True Lavender and Spike Lavender grow in distinct territories with little overlap - spike lavender is sensitive to cold temperatures and is unable to survive above 600 metres or so, whereas true lavender is comfortable above 500 metres and up to 1,500 metres. 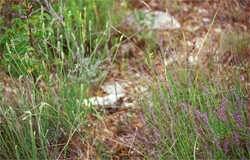 This only gives a region between 500 and 600 metres where both plants can grow and the opportunity for Lavandin to occur. In all of the years we have been travelling to Provence we have never been able to find the " Holy Trinity":- True Lavender, Spike Lavender and Lavandin growing together in the wild. That is until one day last June when Jim was journeying about the countryside looking for wild aromatic plants, sniffing out chemo-types and generally poking about. He did a triple take as there before him was what was obviously a very healthy looking Lavandin plant growing happily in the wild. It could only be there as the result of natural cross-pollination because Lavandin can only be propagated by cuttings. So with great anticipation the search was on. Soon there it was, both parent plants, True Lavender and Spike Lavender growing inches apart with several Lavandin plants in view. The French people in the house nearby must have wondered about this guy yelling yahoo and running around madly photographing grass! A gentleman by the name of Monsieur Grosso also came upon Lavandin in the wild but many years ago and discovered that it produced 4 to 6 times the essential oil of True Lavender, though not of the same high quality required for perfumery or aromatherapy. However, since the majority of the Lavender farmer's customers were only interested in having a Lavender-like smell in their soaps and detergents etc. most farmers decided to adopt this new plant as their crop of choice. Today thanks to the process of propagation, Lavandin Grosso accounts for 80% of the "Lavender" crop grown in Provence - each plant the direct clone of that original wild Lavandin plant.